A NICE FIFTH BEST TIME AND THE SECOND ROW FOR JORDI TORRES IN HIS FIRST EXPERIENCE ON A QUALIFIER TYRE. 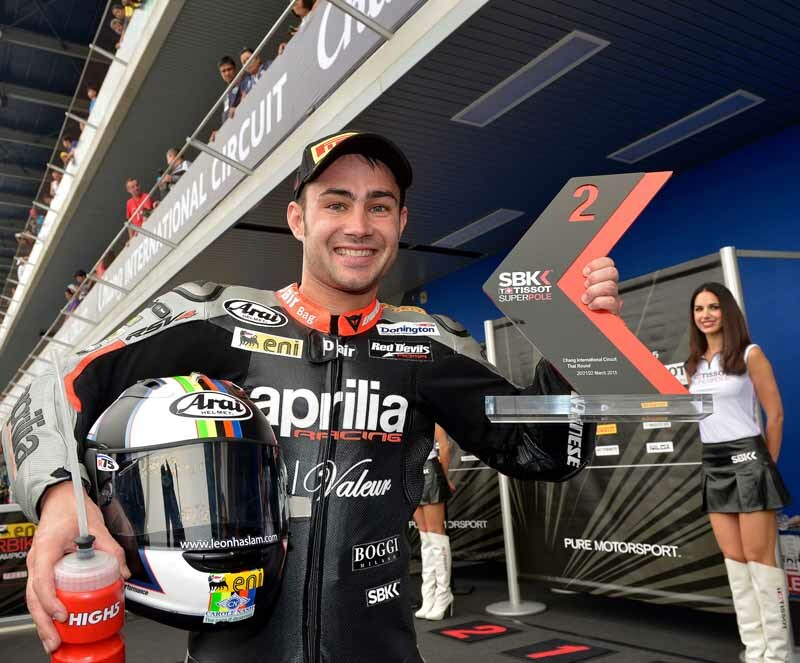 Buriram (Thailand), 21 March 2015 – First and second row on the starting grid for Aprilia, reigning world champion, on the Thai Buriram circuit. It was a spectacular and heated Superpole right down to the end. Taking it with an advantage of just 11 thousandths of a second was Rea, followed by Aprilia standard bearer Leon Haslam, who put in two flying laps on a qualifier tyre. For Leon Haslam (leading the standings after victory in Australia) this is the second start from the front row in two races since making his début with the Aprilia RSV4. Leon was among the front runners from the beginning even in the practice sessions, giving the fans a show and taking full advantage of his RSV4. After putting the best time on the sheets with his first attempt on a qualifier Leon kept on, further improving his performance. Just a small mistake in the final phases kept him from winning his first Superpole with Aprilia, in any case taking a promising second position on the grid for the two races tomorrow. The excellent work done in the garage during the practice sessions allowed Leon to line up on the grid with comforting results in terms of race pace, on a track where the high temperatures make proper tyre management vital. For Jordi Torres, a rookie in World Superbike this year, this was his first experience with a Pirelli Superpole tyre since in Australia the last session had been suspended. In any case, the Spaniard handled this new situation well, finishing with the fifth best time which earns him a spot on the second row of the starting grid for tomorrow.